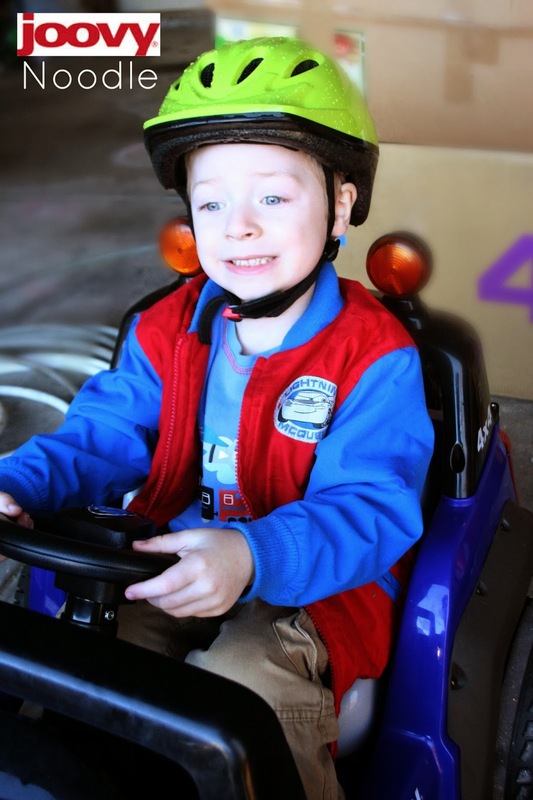 When I think of top Christmas gifts for kids I think of bikes, ride-ons, wagons, etc. This then leads me to think of helmets. We all want our kids to be safe when riding their toys but we also know we have to figure out how to persuade our kids into liking said helmets and wearing them every single time. 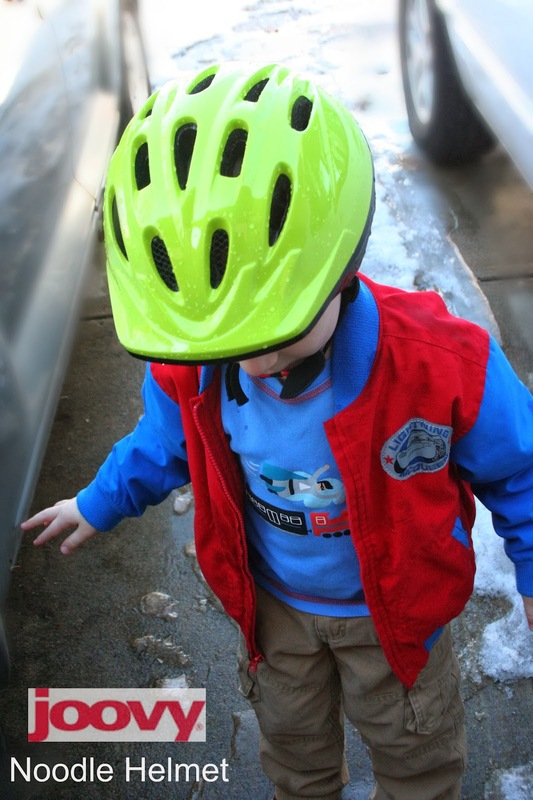 We went to several stores letting M try on helmets only for him to tell us they hurt to wear or they would slide forward and just never fit right. I started thinking are we going to have to special order one? In the midst of this dilemma Joovy wanted to be included in our Christmas Gift Guide. I searched their site and came across the Noodle. I was thinking what do I have to lose, if it is bad I can send it back and just explain that it didn’t work. When the helmet came I let M open it up and acted really excited. I explained that this helmet was super cool. I strapped it on his head and turned the dial till it was snug. At first I thought he was going to complain that it was too tight but he never did and it stayed in place never sliding forward the entire day. I know you are thinking yeah it was new and exciting so of course he wore it. Here is the thing, he wouldn't take it off. As in I went to the grocery store with him wearing it and only at bed did I beg him to take it off. He finally agreed as long as it was by his bed. He wears this helmet like a hat. He was so upset when no one complimented him on his helmet at the grocery store! The only down side to the Noodle would be that there is not YET a youth size so in a few years I am hoping the other ones will fit better, Or perhaps Joovy will have one by then! 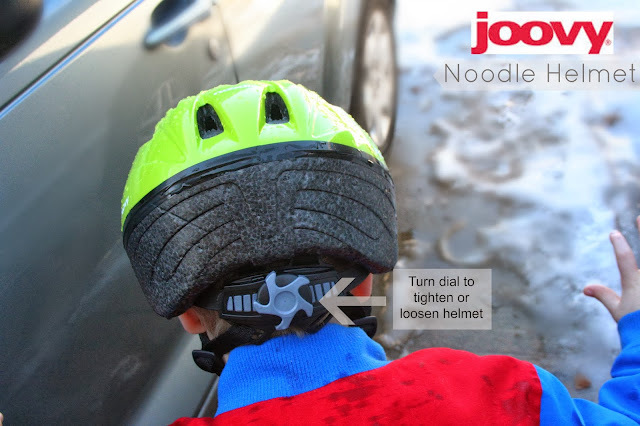 You can purchase a Noodle Helment on the Joovy website for $29.99! Also, be sure to connect with Joovy on their social media outlets, Blog, Facebook, Twitter and Pinterest they have a ton of new products coming out and giveaways!